Nu Chapter was organized in Austin, Texas, on March 29, 1930, by Dr. Annie Webb Blanton. At its beginning only teachers from Hays County were involved. In May, 1948, members from Blanco County were added. October 9, 2018, was a wonderful meeting at St. Mark’s Episcopal Church in San Marcos hosted by the San Marcos members and helped by Tanya’s mother, Dolores Pair, who outdid herself with the wonderful fall decorations. Vice-President Loretta chaired the meeting in the absence of President Tanya. San Marcos members shared lovely finger sandwiches of different fillings, chips and dips, and a dessert table to die for from apple pie to dark chocolate torte. Calories were not an issue. 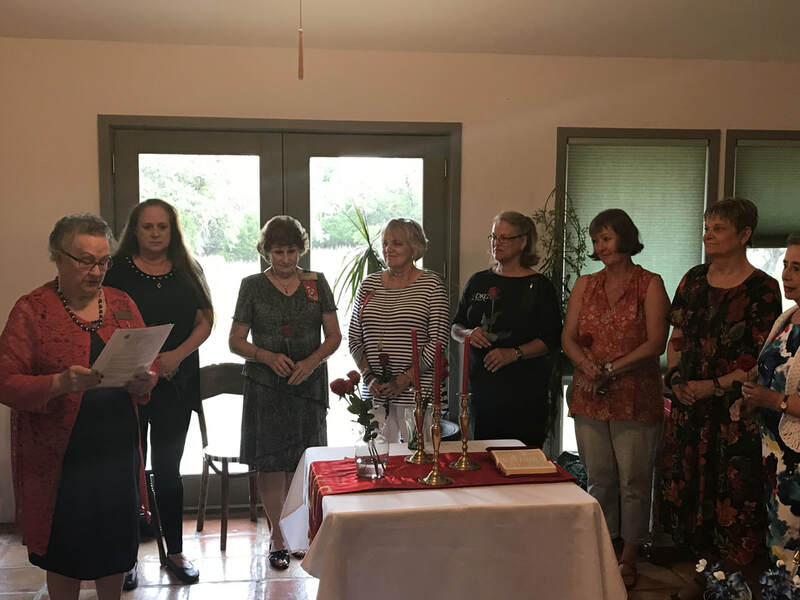 ​August 26, 2018, at 2:00 PM, The Wimberley Library was the scene of the annual Nu Membership Tea to introduce prospective members to the benefits of membership in Nu Chapter of The Delta Kappa Gamma Society International, Texas State Organization. President Tanya did a beautiful job of hosting several members and two prospective members. The refreshment table featured several luscious finger sandwiches and cakes. Sandra introduced Nadyne’s daughter, Melynda, as a prospective honorary member, and Tanya introduced Rebecca Kroener , San Marcos High School, as a prospective active member. 2018 Nu Chapter Officers being installed by past NM State president Nadyne Gartman. President: Tanya; 1st VP Loretta; 2nd VP Karen; Recording Secretary Cheryl; Debra standing in for Corresponding Secretary Carol P.; Treasurer Tonda; and Parliamentarian and Immediate Past President Sandra. the cultural exchange with Kochi, Japan DKG, and an amendment to to our Chapter Rules concerning print media using members' image. We received information concerning our 2018 Scholarship winner, Katie Usry. 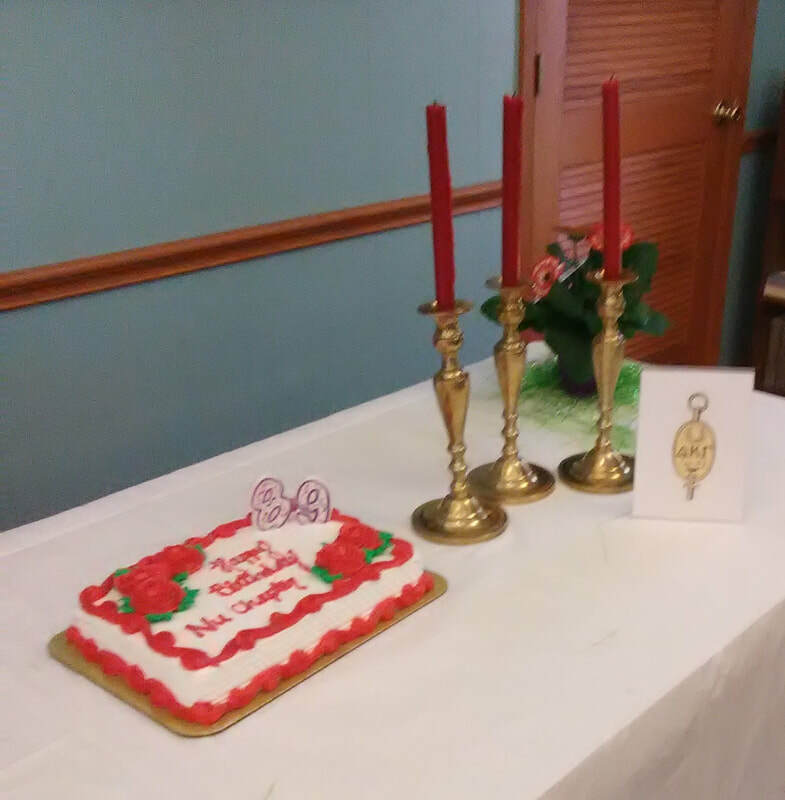 The Ceremonies Committee led a lovely tribute to our Founders, and the meeting culminated with our installation ceremony. The raffle basket, benefitting those going to State Convention, was won by Alice. Birthday drawing for May was won by Nadyne and June's was Tanya. 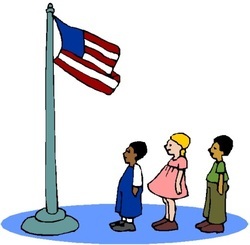 ​It was the culmination of a tremendously successful two bienniums in office for Sandra. She will be missed! Watch this space for upcoming information about Nu Chapter! Dates, Locations, Personalities, and other "stuff"
Note that Nu meetings will be on second Tuesdays in 2018-19 at 5:30 PM in different cities each month. ​ May 14 at at Saint Mark’s Episcopal Church in San Marcos 5:30 with all members hosting a Hawaii theme meal. New Braunfels Tri Social January 25, 2019 attended by Hays County Nu Chapter, Theta Kappa, and Alpha Theta. 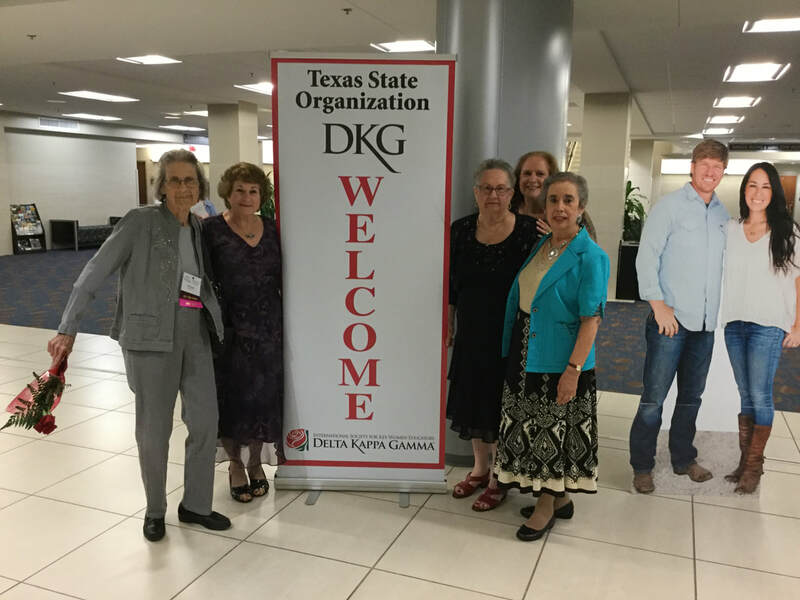 Nu Chapter at TSO Convention, Waco, TX Ruth, Loretta, Nadyne, Tanya, and Sandra. The Scholarship Guidelines and Application forms follow: Click on them and print them out. FYI: If you would like to go back through past issues of Nu Chapter News for previous three years, they are now on Nu News page on this site. Interesting reading. Watch the evolution.